No doubt about it, fresh Mussels are good food. With only 70 calories per 3 ounce serving…1.9 grams of fat, and over 10 grams of protein, they are a lean, mean, feeding machine. There are so many ways to prepare and enjoy them, simply steamed, cooked in a wine and garlic broth, beer and chorizo, marinara or even Wok Smoked! Because of their light shells, you get a good bang for your buck as well; mussels yield more meat per pound than do clams. 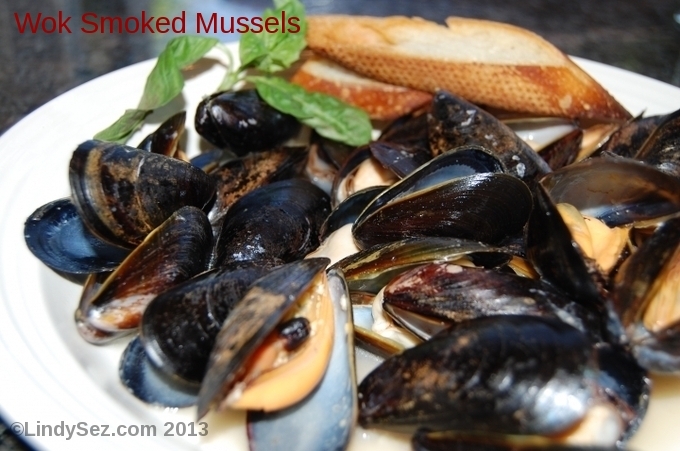 But many people are afraid to work with mussels because they aren’t sure exactly how to prepare them. 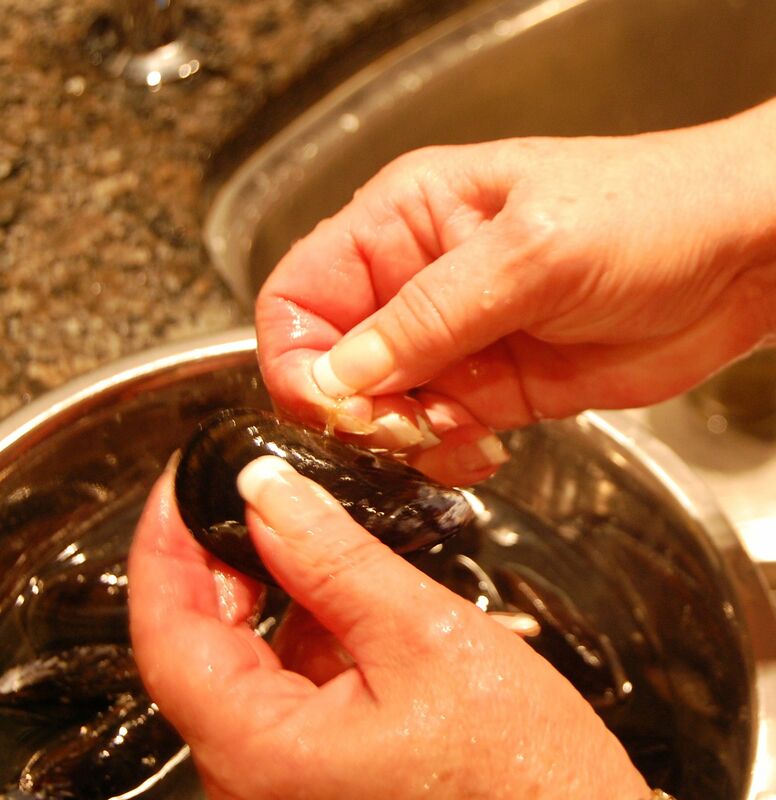 This article will explain everything you need to know about how to prepare and cook fresh mussels. The first thing you have to determine when buying mussels is: are they wild, or farm raised? Each one has to be treated just a bit different. 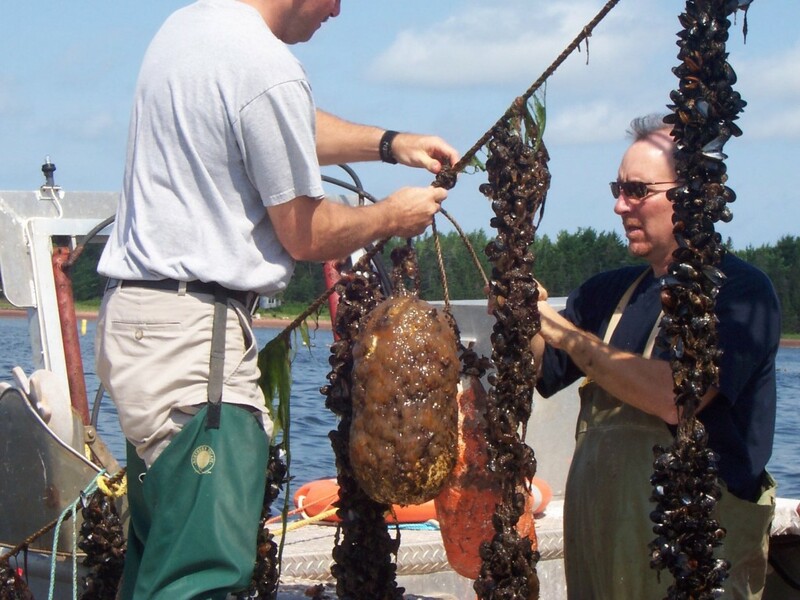 Farm raised mussels are raised on netting, they attach themselves to the nets to grow and are pretty much clean inside since they don’t really get down into the sandy floor bed. But the wild ones, they do get sand and grit in them. And nobody wants to eat sand and grit. So you do need to soak them for about a half an hour to allow them to expel their sand. You will find sites that tell you to soak them in cold water with cornmeal mixed in, I haven’t found that to be too convenient or effective. Then there are those that tell you to soak them in fresh cold water to allow them to breathe, and as they breathe they release the sand and grit. Well, this sounds good in principle, but mussels live in the sea, and fresh water would kill them. And you don’t want to cook dead mussels. So do soak them, but soak them in very salty (like the sea) water, for no more than 1/2 hour. And keep the water cold, in the refrigerator works. do soak them, but soak them in very salty (like the sea) water, for no more than 1/2 hour. As far as those farmed mussels, take them out of whatever plastic wrapper the idiot behind the fish counter put them in and place them in a large bowl covered with a damp (not wet, just damp) cloth. You can keep them in the refrigerator for up to a day, but it’s best if you cook them sooner, like within a few hours. If you are not using the wild mussels immediately, store them also with a damp cloth, soak them right before you plan to cook them. 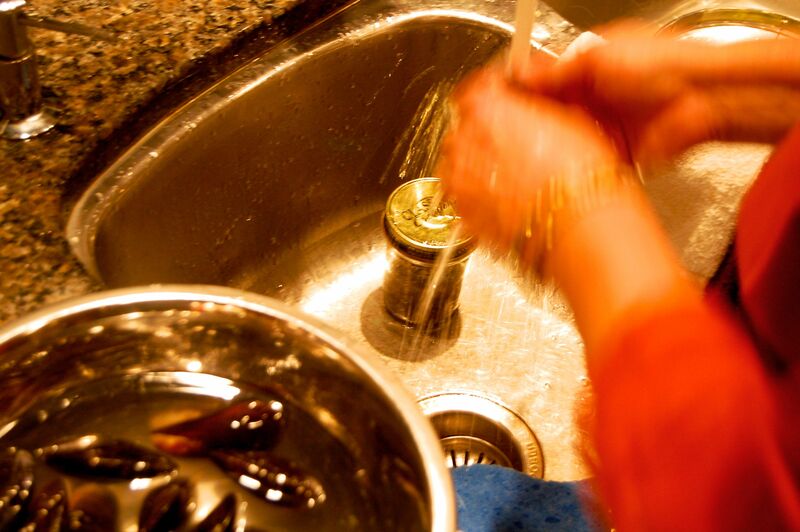 Whether you are cooking with wild, or farmed, when you are ready to cook, you need to give them a good washing. Wash them and look for the “beard”, a fuzzy stringy thing that sticks out of the opening of the shell. This is what they attach themselves with. Not all, but most will have one. To remove this, take your fingers or a pair of needle nose pliers and pull that off, toward the small hinge end of the mussel. Once again, this is to keep the mussel alive by not yanking that across the inside; which can tear the mussel and kill it. You don’t want to cook already dead mussels. OK…the mussels are soaked, cleaned and ready to cook. Check to ensure the mussel is alive before you cook it. If they are tightly closed, that’s good. Sometimes they are slightly open, breathing. Give the shell a tap, if it closes up, good to go. If it doesn’t, it’s dead, throw it away. 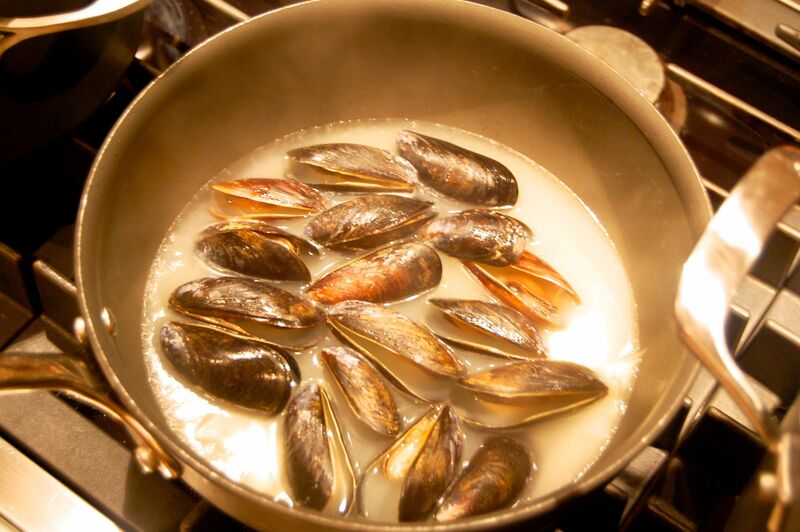 When cooking mussels, regardless of the method, remove them from the heat source soon after they open to prevent them from over-cooking. Mussel meat is very delicate and can turn rubbery if overcooked. LindySez: remember, if the mussel doesn’t open once it’s cooked…it’s not good to eat. Throw it AWAY! Yes, mussels are really simple to make and very nutritious. I’ll have more recipes coming up soon! This is awesome! I’ve never tried Mussels, but given their nutritious benefits and low calories, I may just give them a try after this. Thank you! I hope you do. Show no fear…be brave! Yum! Looks fabulous – I will definitely have to try Mussels! You are killing my diet…these look amazing. My daughter is going lose her freaking mind when she sees this! The seafood buffet people quake when they see us coming.